We often hear the analogy that Malta is a city surrounded by water. And it’s true, our environment is increasingly urban, high rise and densely populated. But a city is more than this stereotype. 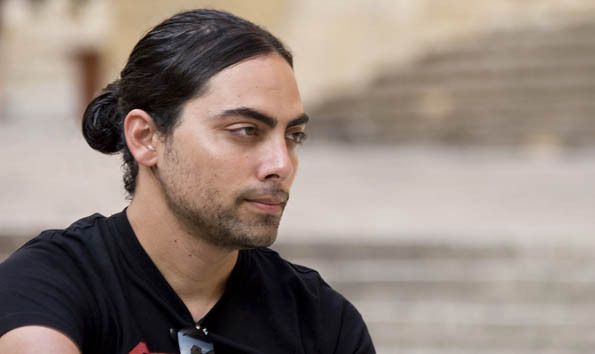 One man who has spent more time than most in analysing the meaning and metaphor of the ‘city’ is Norbert Bugeja, one of Malta’s leading, young, contemporary poets. We’ll get a chance to see him perform his poetry at the launch of his new anthology ‘Bliet’ (Cities) at 8pm, Friday, 11 December, in the Music Room at St James Cavalier Center for Creativity, Valletta. Bugeja’s new work is being considered a major contribution to contemporary literature in Maltese. His performance will be accompanied by leading percussionist Renzo Spiteri and acclaimed actor/performer Nicole Bugeja. At the launch, Norbert will perform some of his most popular poems. You’re advised to book early as the event is expected to attract a good audience. The poems in ‘Bliet’ capture the ‘here and now’ of urban living in cities and towns in and around the Mediterranean as well as in Malta. Bugeja’s poetry carries with it the fascination with journeying, hot on the trail of those unusual stories hidden behind the thick walls, backstreets, squares and narrow pathways where this country and her shadow-cities carry on with their everyday chores. ‘Bliet’ is a relentless autopsy of every nook and cranny we live in and Bugeja leaves no stone unturned. It’s a story in image, rhythm and metaphor; the exhilarating diary of an urban soul that will take you around the steps, ruins, lanes, shopping malls, arenas and rivers that shape the city’s body. From Valletta to Cordoba, from Rome to Seville and Tangiers, from the Birgu’s to the Diju Balli’s of the mind’s eye, ‘Bliet’ is a masterful portrait of our cities’ explosive interiors. Fellow poet, and critic, Maria Grech Ganado has this to say of Bugeja’s work: “Norbert’s poems remind me of sculpture, with the wind as sculptor. His metaphors are among the strongest I have ever read, his rhythms trance-like. His cities are hewn out of rock but just as simultaneously out of sand. Reading him is like finding a treasure, a rewarding and, to me, a unique experience.’ ‘Bliet’ comes too with an introduction by Dr Adrian Grima, a foremost Maltese literary critic and poet in his own right. Biog: Norbert Bugeja is a leading writer within the new movement of Maltese literature. His poetry has been published in international poetry journals and read during various poetry festivals. In 2005, he published his first collection of verse, ‘Stay, Fairy Tale, Stay! Memoirs of a City Cast Adrift’ (Midsea Books/Inizjamed, 2005). Norbert Bugeja was awarded his BA (Hons) and MA in English from the University of Malta. As a Commonwealth Doctoral Scholar, he is currently concluding his doctoral thesis and lecturing at the University of Warwick in the UK. ‘Bliet’ is now on sale and is available at major booksellers in Malta and Gozo. When: Friday, 11 December 2009, 8pm.